I love a good shawarma. Spice infused meat spit roasted on a vertical grill, it always tastes better in Dubai and Turkey. The meat slowly cooks on a spit in it’s own fat and juices then heaps of the meat stuffed into pitta bread is sublime. It’s rare to find a good quality eatery serving shawarma so making my own was the next best thing. 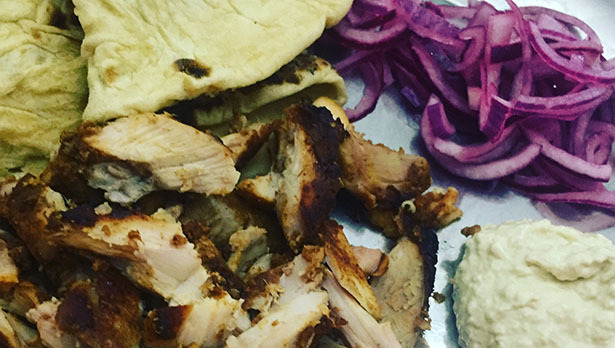 Homemade chicken shawarma is guilt free way of eating that kebab we all secretly crave. My version of the shawarma isn’t a traditional recipe but my adaptation. The spices I used are inspired by the traditional shawarma but with a cooking with Sukhi twist. 1Lightly beat the yoghurt and pour onto some kitchen paper. Layer around three sheets. After 5 minutes or so repeat this process with fresh kitchen paper to ensure you extract as much moisture from the yoghurt as you can. 2In a mixing bowl add all the ingredients apart from the chicken and mix well. Add the yoghurt and mix again. Your kitchen will smell like an arabic spice souk with all the aromas. 3Add the chicken to the marinade and coat all the pieces well. Cover and leave in the fridge for 4-24 hours. 4Preheat the oven to 200 degrees Celsius and place the chicken onto a foil lined baking tray and cook for 15 minutes turning the chicken over half way. 5Take the chicken out of the oven a disregard the moisture released by the chicken. 6Grill the chicken on both sides on the highest setting for around 3 minutes on each side. You want to create a slightly chargrilled effect. 7Chop the chicken into small pieces and serve in pitta bread,naan or flat bread with a generous helping of hummus, tomatoes, cucumber, red onions pickled in salt and lime juice.